Asia Asset Finance Limited (AAFL) will issue 120,000,000 shares as an Initial Public Offering (IPO) from November 28, 2011 at a cost of Rs. 2.50 each. According to AAFL, an additional 50,160,129 shares will be issued if the option is exercised. The share issue will be closed on December 15. AAFL, Managing Director Manohan addressing the media. 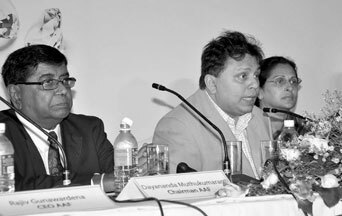 Speaking at a media briefing, AAFL , Chairman Dayananda Muthukumarana highlighted the significant progress achieved by the company during the past few years and said the objective of issuing 170,160,129 shares is to raise a sum of Rs. 425 m.
He said AAFL has sent a clear signal to the public that the monies raised by the IPO will offer the customers a wider range of innovative and tailor-made products and services in the future. The AAFL also states that 90 percent of the funds raised would be for investment in the core operation of the organisation, which includes 20 percent leasing, 10 percent corporate loans, 10 percent higher purchases, 15 percent three wheel loans, 10 percent group personal loans, 10 percent consumer finance, 15 percent pawning and the remaining 10 percent will be utilised for branch expansion and also product development of the company. He said the Company also introduced a novel 360 degree concept which focus on building customer-loyalty through providing credit facilities and helping customers maximise revenue generation to facilitate repayment of loans. "We hope to do this by networking the customer base so that demand and supply can be met within its customer base thus creating new opportunities and markets for customers." Asia Capital PLC Managing Director, Manohan Nanayakkara said AAFL has a history of over 40 years and it is a registered finance company which was founded in 1970. It was known as 'Finance and Land Sales'. The Company was acquired and restructured by Asia Capital PLC in 2004 and rebranded as Asia Asset Finance Ltd.
AAFL currently operates nine branches including Negombo, Kurunegala, Kalutara, Moratuwa, Jaffna. The Head Office is in Dharmapala Mawatha, Colombo 3. Another 13 branches will be opened by next year.